I just read about sub-pixel rendering on good ol' wikipedia. If you've ever needed to draw a vertical line exactly between two pixels, subpixel rendering is what you're looking for. 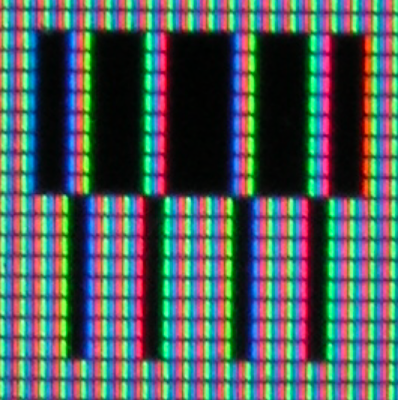 On an LCD screen, each pixel is three little bars, one red, one green, one blue. All on looks like white, all off like black. The subpixel trick is to light, for example, the blue bar of one pixel, and the red and green bars of the next pixel to the right. The effect is a white pixel, because you have a red bar, a green bar, and a blue bar, all together, all lit up. Below is how it looks enlarged, so you see each pixel value. 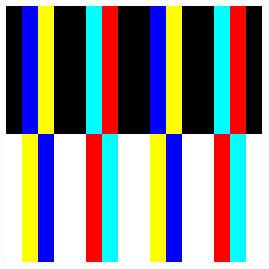 Notice that there are no black or white vertical lines. The appearance of black and white is a side-effect of the way sub-pixels are lined up on an LCD screen - and if you're using a CRT or an LCD that doesn't order its subpixels the same way, you'll be wondering what the hell I'm talking about. Ok, that was the enlarged image, but in case you're having doubts, this is how it looks if you take a traditional screenshot (ie, with your camera). Here you can see how each pixel is lit and where the black and white lines come from. You can't imagine how many problems this solves. Not world hunger, unfortunately, but let's say you're drawing a vertical arrow in a 16x16 icon. You want a sharp point on your arrow, but if you make the tip 1 pixel wide the arrow won't be centered in the icon. Subpixel rendering is the solution! Similarly, you can control how curvy a curve is by lighting only the pixels that make your curve smoother: a curve going up and right (the top-left corner of a rounded-corners box, for example), would benefit from a little dash of blue on the outside, whereas the curves on the other side would benefit from a little bit of red.